Sewage Sludge Digestion Ofwat UK Changes - Investment Opportunity? Sewage Sludge Digestion Ofwat UK Changes – Investment Opportunity? It just might be the time to invest in Sewage Sludge Digestion. All the most successful financial investors know that timing is everything, and now could be the right time for sewage sludge digesters! There is a right time to enter the market and a wrong one. This advice would not be wasted on manufacturers of equipment for the treatment of wastewater right now. Despite the fact that there is a litany of promising technologies brought to the marketplace only to fail. Fail, because they were the right product, but at the wrong time. However, it remains as true as it ever was, that to invest in the right technology at the right time, can be wonderfully profitable! Identifying the right time to enter any market is not easy, but the signals emerging at the moment for sewage sludge digestion, give a clear message. That message is that a great opportunity may be coming soon! Consider that climate change is beyond headline news, and at all levels the expectation is implementation of carbon reduction. The duty rests with companies and governments to ensure that the ambitions of last December’s Paris Agreement are met. Massive internationally agreed emissions reduction targets, must now be carried forward by all nations. Why Not a Massive Program to Build Sewage Sludge Digesters? For these carbon emissions targets to be met, one of the first and most obvious areas where there are big benefits yet to be gained, is in anaerobic digestion of sewage sludge. Even now this is a technology which has been so far, greatly under-used in many countries. Much more can still be done to reduce climate changing emissions by using anaerobic digestion technology at sewage works. Incineration of sewage sludge which was the favourite solution until 10 to 15 years ago, is now too costly in terms of its energy use, let alone its high carbon emissions. That means as those sewage sludge disposal plants come up for renewal they will be converted to anaerobic digestion plants, which can in most cases, when built using modern sludge preconditioning methods, (and often as high gas yielding, 2 stage mesophilic or thermophilic digestion processes), provide all the electrical power needed to run the sewage treatment works (WasteWater Plants) that feed them with sludge. By using the sludge produced by a sewage works to power it, the carbon emissions from wastewater treatment fall drastically. This a is big win, and it won’t go unnoticed by climate change policy makers. Not only that, the anaerobic digestion process provides the ability to recycle sewage sludge nutrients in a safe way, to the land. It is also referred to as anaerobic treatment. As if that was no not, its own, a commanding reason for the biological digestion of sewage sludge the newest, most advanced sewage sludge treatment AD plants, now coming on-stream also recycle phosphate. The availability of adequate phosphate is essential to all life including crop growth, but it is a finite natural resource, and its recycling will in the future become increasingly important in terms of sustainability. Finally, there is a rising awareness that many nations, including the UK, are no longer in charge of their own energy supplies. Large energy imports can jeopardise security of supply. If a country suffers a lack of energy supply from imported energy sources leading to energy rationing, what could be better the the water companies, who are usually also responsible for clean water provision, being in control of their own electricity supplies. Conceivably, clean water could be made available throughout crises which might otherwise jeopardise national water supplies, and the health of the public. The UK’s water industry regulator, Ofwat (in Ofwat’s published 2020 proposals) has made it clear that in the next periodic review it will be most likely to open up the UK market for sewage sludge disposal/ processing. Unlike many other countries, the UK Water Act which privatized the water industry in the UK, made it the duty of the water undertakers to themselves dispose of sewage sludge responsibly. At that time, when most sewage sludge from large conurbations in the UK was disposed of to sea, sewage sludge had no possibility of being conceived as a by-product which could have value for its energy content. Now that that has changed, the regulations which until now, in the UK, have effectively prevented the opening up of sewage sludge digestion as a function which could be isolated from sewage treatment, will be changed. The change will quite possibly require the Water Companies to, for the first time, make available their sludge for others to take and treat, and the basis will be much more upon the financial benefits, and secondly the environmental benefits of so doing. This will be part of Ofwat’s policy of continuing to require a much greater commitment to sustainability, on behalf of the Water PLCs. The day has truly arrived for sewage sludge digestion Ofwat must now realize. At the same time the pressure on sludge disposal to land continues to increase. The space available for landfilling of solid waste continues to diminish. The use of the space that is available has been progressively restricted by European directives. However, after anaerobic digestion treatment there is an opportunity to re-classify the digestate it produces not as a waste but as a product. To view this video on the YouTube website click here. The point about sewage sludge digestion Ofwat needs to consider is that no restrictions to land disposal apply to a fertiliser product! At a stroke the problem of land shortages evaporates! Also, Brexit is unlikely to alter the fact that the build-up of sewage contaminants from sewage sludge disposal prevents their long-term availability, no matter where the relevant regulations are to be made in future. Reading these signals could not be simpler: the future is anaerobic, and sewage sludge from sewage works of all sizes could soon be available to any bidder, within or outside the UK Water Industry, to take it, and process it both for energy and its physical by-products. Sewage sludge is actually a difficult substrate to treat anaerobically. The anaerobic digestion of sewage sludge requires a long hydraulic retention time (upwards of 12 days) in heated digesters, which leads to a capital-intensive process. Research led initiatives over the last decade have led to improved reactor designs, incorporating preconditioning of sewage sludge by methods such as high pressure and temperature hydrolysis, enzyme hydrolysis, and sonification. However, sewage sludge, by its very nature, is much harder to digest than organic materials such as the organic content of domestic waste, including food waste). The Waste Management Industry may find that it can absorb considerable amounts of sewage sludge through co-digestion of this material with other wastes, such as food waste, and by so doing maximise the use of existing anaerobic digestion plant. For example, sewage sludge varies very little seasonally, whereas many other organic waste AD plant feedstocks can be highly seasonal. The co-treatment of sewage sludge in a seasonally affected biogas plant may provide for a much more stable population of active biomass, in the reactor, allowing a highly beneficial synergistic use of sewage sludge when co-disposed. Many Waste Management Industry biogas plant operators have made big strides toward enhanced performance of their anaerobic digesters through innovation, already. Those that recognise the impetus to re-evaluate the anaerobic treatability of many of their industrial waste streams, now will do well. The race will be on, to decide upon cost-effective, and sustainable, sewage waste treatment strategies to use sewage sludge in their plants, and build new ones where applicable. Those business which innovate to co-dispose existing waste management industry organic materials which can generally be treated at much higher organic loading rates than sewage sludge, with sewage sludge will have a great opportunity now in the UK and overseas. Anaerobic digestion should no longer be seen as a process for stabilizing sludge by anaerobic treatment, but as an opportunity to recover the energy embedded in the substrate. As long ago as 2007, it was estimated (“Anaerobic Energy”, Waste & Wastewater Treatment Magazine, March 2007) that conventional anaerobic digestion of the UK’s municipal solid waste could generate 1.4GW electricity, or 1.9% of the nation’s demand. If these calculations also include potential energy generation from sewage sludge, then anaerobic digestion would will be a still more significant player in the renewable-energy market. Since this article was written there have been additional reasons to build sewage sludge biogas plants and that lies in the upgrading of the biogas produced into biomethane. Biomethane can be used as a transport fuel, when it is there are substantial advantages that water companies, as fleet operators, can gain by using this clean renewable fuel, above and beyond delivering the energy into the electricity grid. LNG Trucks and Biogas Buses – Breaking News! 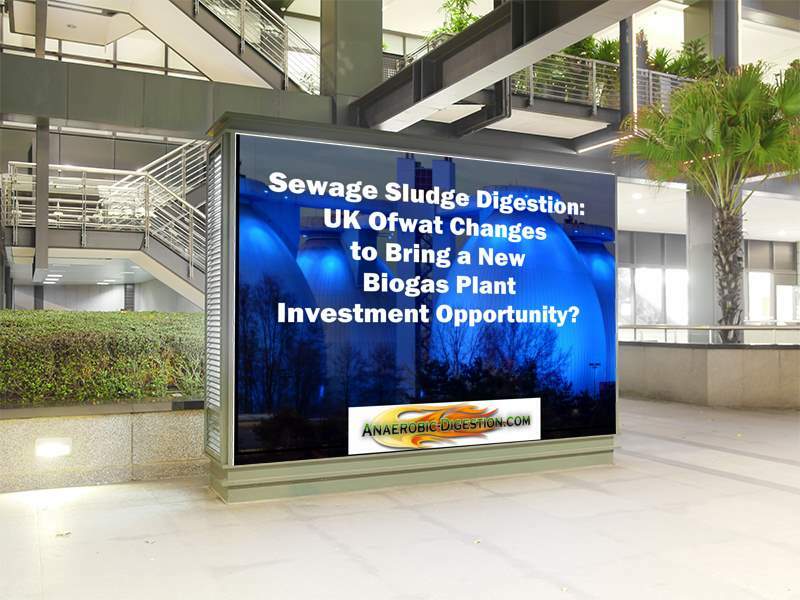 7 Responses to Sewage Sludge Digestion Ofwat UK Changes – Investment Opportunity? Outlined here are a number of ideas for getting into sewage sludge digestion. Maybe people with vision and an inside plan of action before hand might do well out of this. Please update this page soon. I will bookmark. This will be wake-up call to Water Co guys. They think of sludge as a nuisance and a cost burden. AD plants operators value it. We want to process it, you bet. We can make sludge pay. We will bid when Ofwat stirs itself to actually get the regulations changed. Good article. Keep publishing these. Thanks. focus to solve completely the problem of the toxic organics and inorganic compounds in sludge. In the assessment and selection of options for energy recovery by means of biological methods, this aspect has to be taken into account. No doubt with the right choices being made the opportunity for investment profit exist. I doubt Ofwat will get around to making changes. These changes have been discussed since 2010. Nothing happened to date. Ofwat like all the other regulators are just pen pushers. when it comes to taking action to protect the public they never get on and do anything. Re-nationalisation is the only answer. Labour is going to nationalise the water industry. On the face of it, Ofgem will soon no longer exist. Sewage sludge should be kept for the people. Keep biogas in the hands of the people, make energy, give to the poor. A huge problem which arises in sludge disposal is that it has been impossible to repeat sludge applications to individual fields more than a given number of times before heavy metal build-up gets too great for healthy crop growth and the sludge has to be sent somewhere else. This is not mentioned in this write-up. It is not clear how this can be dealt with if sewage sludge is co-disposed. Objections to privatising sewage sludge disposal must therefore be made before it is too-late and this dangerous idea is given the OK by Ofwat.